An amateur astronomer has made a "major astronomical discovery" while accessing a telescope in Hawaii over the internet while at work in the UK. Nick Howes took pictures showing the icy nucleus of a comet breaking up while he sat at his desk in Wiltshire. He used a remote-controlled telescope through the Faulkes Telescope Project, run by experts from Cardiff University. Dr Paul Roche said the university was delighted and that the images appear to show the comet nucleus disintegrating. "What this illustrates is what is achievable when amateur astronomers can get their hands on such a powerful telescope," he said. The School of Physics and Astronomy's project, which was created to help teach schoolchildren science and maths, offers access to a pair of remotely controlled telescopes, located on the Hawaiian island of Maui, and at Siding Spring in Australia - via the internet. Using the £5m Faulkes Telescope North in Maui, Mr Howes captured six images that showed what appears to be a mountain-sized chunk of ice that has broken away from the giant "dirty snowball" that forms the nucleus of a comet. 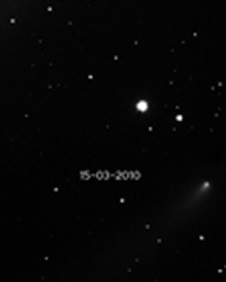 A second set of images obtained the following day - last Friday - showed that the new fragment is still trailing the comet, which is officially called Comet C2007 C3. Dr Roche said: "As the nucleus of a comet is typically tens of kilometres across, this fragment is probably mountain-sized, and will become a small comet as it gradually separates from its parent." It is now hoped that astronomers will follow up Mr Howes's discovery using instruments such as the Hubble space telescope. "We hope to involve schools in observing this comet over the next few weeks, so that we can see what happens to this new fragment," added Dr Roche. It is also hoped that this discovery will help encourage others to use the telescope for research and to help make new scientific discoveries. Last year, another amateur astronomer, working with several UK schools and the Faulkes Telescope Project, discovered the fastest-rotating asteroid in the solar system. More than 200 UK schools have used the telescopes to help in science lessons, often gathering data that is used by university researchers. "As well as amateur astronomers this project allows researchers from the university to help schools access professional equipment, and learn more about how modern science is really done," Dr Roche said. "We hope this discovery will help encourage others to use the Faulkes Telescopes and lead to even more scientific discoveries." The Faulkes Telescope Project was launched in March 2004 by the Dill Faulkes Educational Trust, as a way of helping to inspire school students to study science and maths.